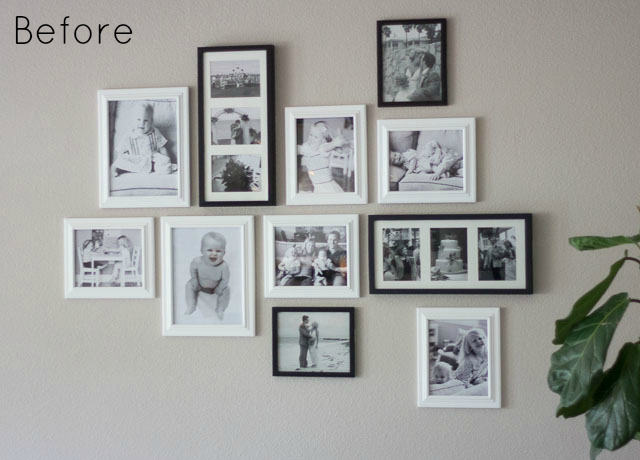 On Tuesday I shared some kid-friendly updates I recently made to our living room. If you had a keen eye, you may have noticed that our gallery wall got a little kid-friendly update as well! I figured one way to make the room a welcoming space for our girls was to showcase some of their best creations on the main wall in the living room. 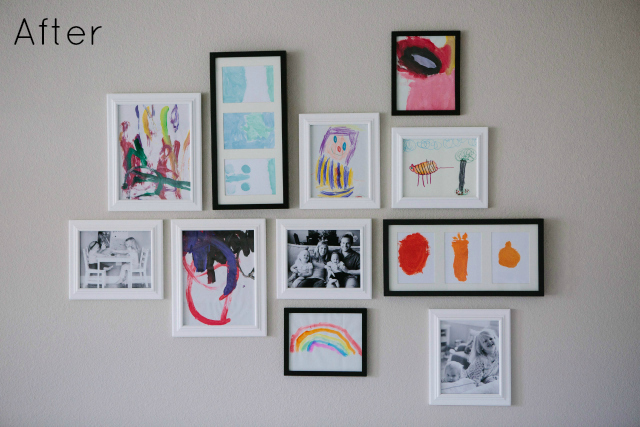 While I liked the family photo wall, I am loving the pops of color and whimsey created by swapping out some of the photos for the girls’ art. I kept the frames exactly as they were before. 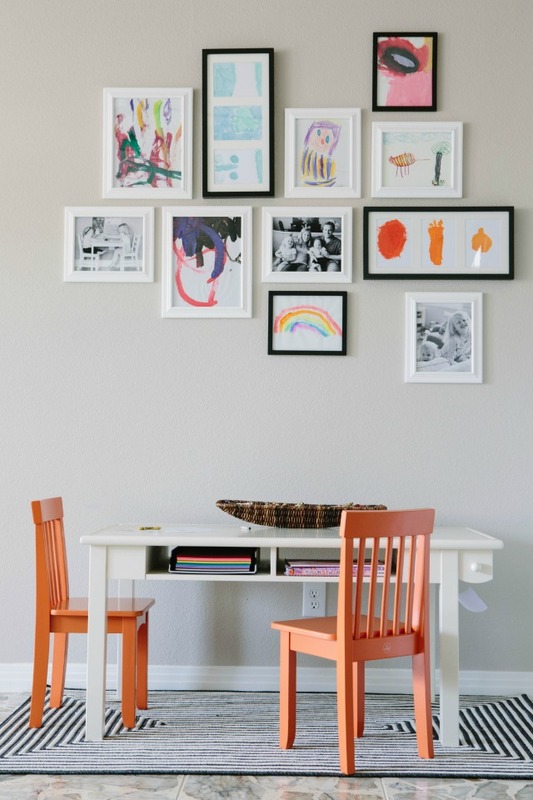 Incorporating a few pieces of kids art in with your family photos or ‘adult’ art pieces adds such a fun, eclectic vibe to a room. 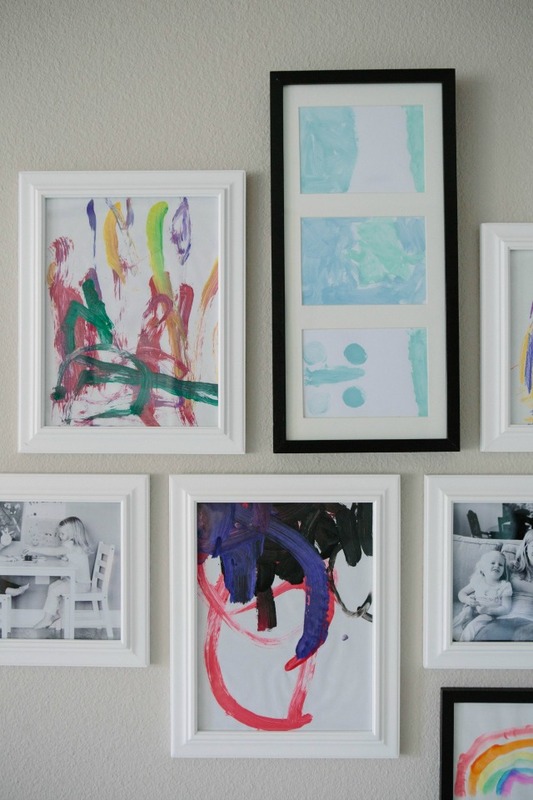 Below are a few tips for making your own kids art gallery wall. For other ideas be sure to check out my simple clothespin art wall and kids art bunting! 1. 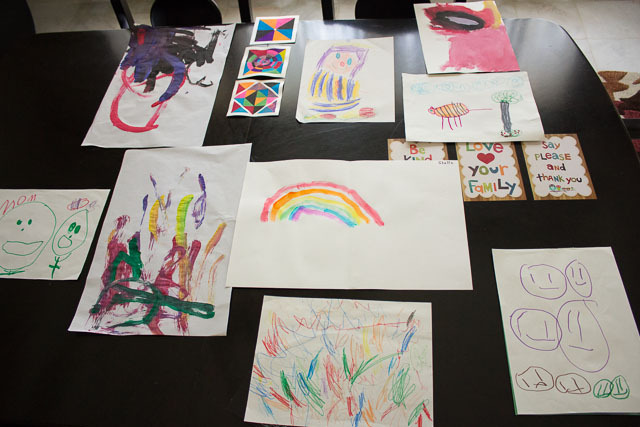 Use an eclectic mix – I sorted through the girls’ projects to find the most colorful and meaningful ones. I chose a mix of paintings and drawings in a rainbow of colors for the art wall. 2. Experiment with different layouts – I then laid out my favorite art pieces on the dining table in roughly the same position as the frames on the gallery wall. I experimented with different pieces of art in different spots until I found a look that I liked. 3. Stick with simple frames – I think one element that makes our art wall work well is the use of simple black and white frames. It help keeps the eye focused on the artwork. I kept a few black and white family photos in the mix to balance out all the bright colors in the art. 4. 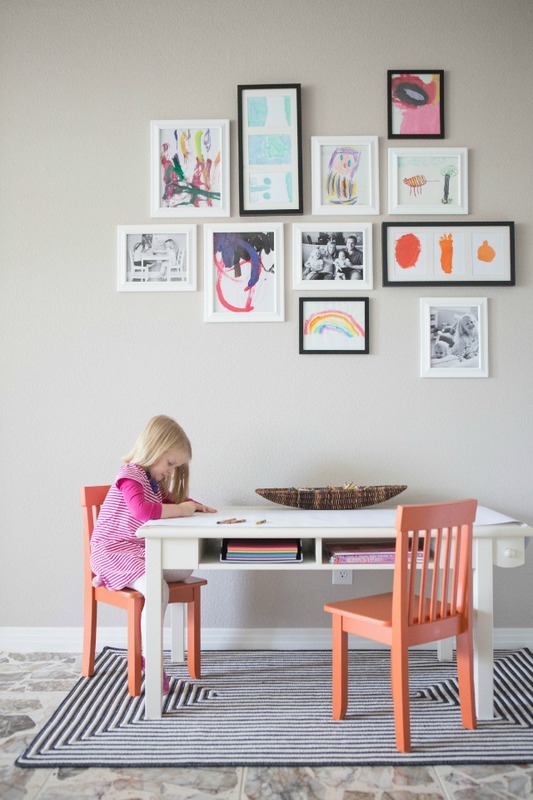 Add a mat – any kids art piece can be instantly elevated by matting and framing it. You can find inexpensive mats at your local craft store such as Hobby Lobby. 6. 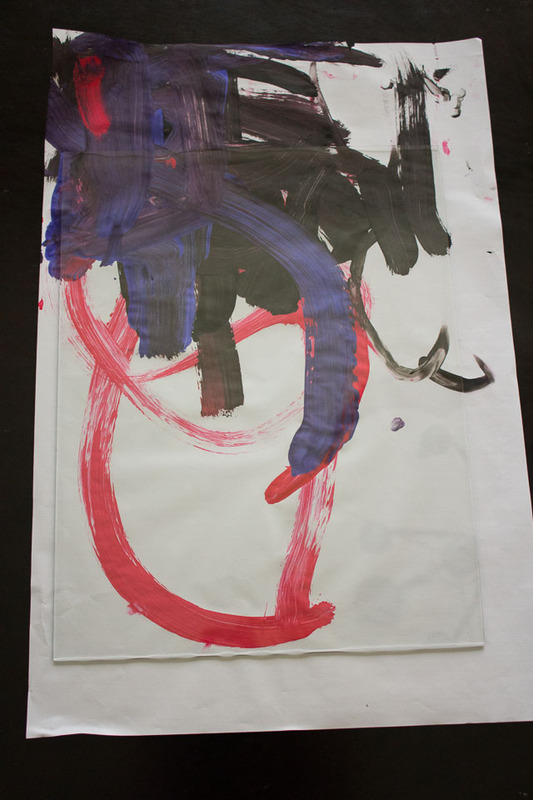 ‘Commission’ some new art to fill in gaps – I couldn’t find any art that was a great fit for my two narrow black frames with three 5×7 slots, so I decided to commission some original art from my 4 year old! I wanted to add in some orange and light blue to coordinate with the rest of our living room so I gave her a few shades of each color, cut out some 5×7 pieces of paper, and let her go nuts with whatever she wanted to paint. She had fun and they turned out great! Want to see more of our living room? Don’t miss my top tips for creating a kid-friendly living room and the kid-friendly furnishings I incorporated into the room! Photos of finished art wall by Candice Stringham.